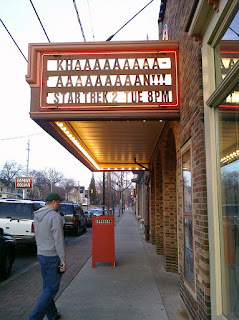 Jennifer's 365 Project: 378/365 - KAAAAHHHHHNNNN!!!! Tonight Wealthy Theatre is playing a great movie - Star Trek II. So Chris and I headed down to the theatre, slightly earlier than the last few times to ensure decent seating and not having to wait in line too long. Still, it's great to see more people coming to the theatre, enjoying the atmosphere and great movies. The theatre was in a very Star Trek mood, playing music from the movie prior to it playing and using a Spock stamp for hand-stamping. Apparently, they were even serving Romulan Ale. 371/365 - Who You Gonna Call? 361/365 - 80's Fashion & Mini-Keyboards! 359/365 - Fog of War? 353/365 - The Xbox 360 Has Landed...Again!